With the new groupings of how many runners each country are allocated in the middle and long distance races now based on positions in the long, middle and relay over the previous 2 years, these last three events of WOC2014 are going to be crucial for New Zealand. Thus Matt and Greta set out today knowing that they were running not only as individuals but carrying the hopes of the rest of us. 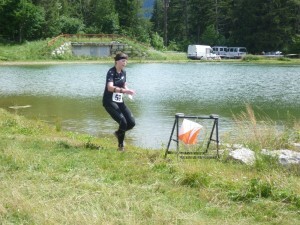 Among the alpine forests and meadows on courses that were physically very tough both performed extremely creditably. Matt, with an early start, felt that racing at about 1300 m above sea level, he ultimately suffered from his short time at altitude compared to the rest of the team. He also had to suffer the frustration of being followed for a long period of time by another orienteer whom he had caught. Unlike some, he also coped with the rather complex map change where the course setting was such that the second start triangle was also a control site, thus leading to a triangle, superimposed on a circle, with three lines coming out of them! Despite a few wavers following the arena run through, he gutted out the last 3k of the 16.4k, 800m climb total, to come in 52nd, feeling it a great experience to have behind him for future years, as well as gaining some valuable team points for the men. Greta, whom the redrawn start list had pushed to a late start time, which coincided with the re-arrival of the rain, similarly tired towards the end. However, at that stage she was in a group of 3 or 4 and had the presence of mind not only to stick with them, coming in 37th, only just over 16 minutes down for her 11 km and 495 m climb, but also to inadvertently knock over the last control, so that the following group had to scramble to punch! 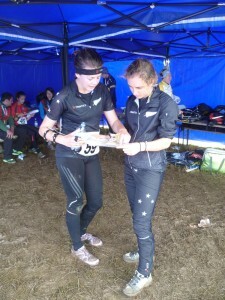 Sadly, from the point of view of the New Zealand spectators, enjoying the mud, intermittent rain, and finally sun of the arena, there was a somewhat arbitrary decision by the IOF Senior Event Advisor to start the top women in the middle of the field, rather than at the end, purely to suit television coverage. Not only did this lead to a heated team managers meeting the evening before, but meant that although Matt was announced as in 2nd place when he finished, Greta, in terms of the commentary, never got a look in – the winner having already being declared while a third of the field were still out on the course! Oh yes, who won? Another impressive performance from Thierry Gueorgiou saw him take his third long distance title following wins in France in 2011 and Finland last year. In the women’s Svetlana Mironava from Russia pushed Tove Alexandersson into another 2nd place. So with a satisfactory long distance behind us we now turn our attention to the even higher terrain of Campomulo, back near Asiago, for both the middle distance and the relay.